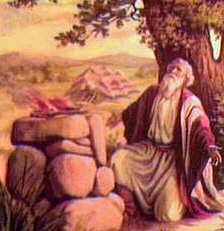 All through history ever since Adam’s fall, God has had people who loved Him with all their hearts, held His truth as superior to even the greatest human thought, and were willing to sacrifice their possessions and even life itself to uphold the heavenly principles, as presented in His holy word, the Bible. They expressed their gratitude to the Creator–first, for giving them life and, second, for providing a way for them to escape from the snare of the evil one, who stole from Adam the dominion over this world. Some such notable individuals are presented by the apostle Paul in Hebrews 11. Those were people who bucked the system; they were humble but powerful, for they were filled with the values God’s kingdom. They looked with great anticipation for the coming of the promised Messiah, who would break the stranglehold of the evil one. Sometimes these people were surrounded by like-minded ones who supported each other in their holy calling and way of life, as in the case of Abraham for a major part of his life. But at other times, they were all alone, as happened to Joseph when he was sold by his brothers to be a slave in Egypt. But they were not really alone, and they would have been the first to tell you so. Abraham would have told you that he had communicated with God Himself and that he was surrounded by His power. His grandson, Jacob, would tell you that he saw heaven opened and ministering angels going up and down between earth and God’s throne. And Jacob’s son, Joseph, would tell you that accepting everything that comes to you as from God’s hand, no matter how bad it seems–and always putting God in first place–will sometimes put you in prison but may also place you in a position to exercise a tremendous amount of influence. Then, Daniel would tell you the same, while reminding you that his loyalty to God caused people to hate him and want to destroy him. But God worked miracles to save him and many others from evil powers. But there were many, many people who would tell you that their love for God brought them persecution and death. At the same time, they would remind you of the three Hebrews who were thrown in the furnace after telling King Nebuchadnezzar it didn’t matter what he did to them–they were going to put God first. This was willing, loving obedience, because they had a perspective very different from that of their persecutors and the society around them. What was that perspective? It’s usually expressed as choosing good over evil, obedience over disobedience, or even life over death. But it is a way of thinking that focuses on the Creator’s values, rather than putting self first. By contrast, evil is focused on self-interest, never minding that it is shortsighted. That’s what got Adam and Eve into trouble. What a huge difference it would have made if they had ignored what appeared to be in their own self-interest and had trusted the One who had given them everything! Actually, everyone who was ever born into this sin-cursed world–and this includes all those faithful ones from Adam’s son Abel through the patriarchs, from Moses to Christ, all down through the Dark Ages through the Reformation to our day–has had the same choice: Be consumed by self-interest, or cherish the Creator’s principles of blessing others and trusting Him. It’s no different today. Oh, yes, the circumstances change, the place may be different, and people may have differences of language and even culture. But there is a common bond that characterizes those who are in the world but not of it (John 17:14-15, 16). They trust God and His word to lay out the problem (sin) and its solution (the redeeming power of Jesus and His example). They seek to fathom the wisdom, the blessing, the peace, the power, the love beaming the realm of eternity. 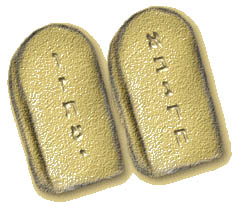 In our day, when media and technology are beaming every possible philosophy and every possible godless perversion directly into homes and computers to the far corners of the globe, and even as religious organizations proclaim their doctrines, traditions, and predictions, it becomes all the more important to build on the same foundation as did those listed in Hebrews 11. In fact, this was done by early Adventists, the forebears of this website’s organizers. You can read about the various religious persuasions from which they came. You can wonder at their courage in preaching that Christ would return to earth no later than October 22, 1844, as enumerated in prophecy that no one could fault. You can even be amazed that a few of them had the faith to believe that their inter pretations, not the prophecies of God’s word, were what had missed the mark. Their intense searching uncovered the correlations between the symbolic Old Testament sanctuary services and the literal ministry being accomplished by Jesus as High Priest in the heavenly sanctuary. But then you have to pause and be amazed that a movement impelled by cutting-edge spiritual ideas in the latter half of the 19th century, after developing into a well-organized church spanning the globe, could abandon the very foundation that anchored it to Christ the Rock. Seventh-day Adventists began as a special, distinct people with a specific message; but time and political crisis were successful in pushing them off of that foundation. Within just a few decades, Ellen G. White, who was there in 1844, began sending startling warnings and reproofs to a church that was increasingly resembling the world. How was it possible? “The line of demarcation between worldlings and many professed Christians is almost indistinguishable. Many who were once earnest Adventists are conforming to the world–to its practices, its customs, its selfishness. Instead of leading the world to render obedience to God's law, the church is uniting more and more closely with the world in transgression. Daily the church is becoming converted to the world.” –Ellen G. White, Testimonies for the Church, vol. 8, pp. 118, 119. Unfortunately, it was what one would expect. Isn’t that the way human nature tends to go? In fact, going back to the world’s beginning again and panning forward, rare were the times when a group remained true to principle for long. There were always a few, but look how their leaders were the key factor: A handful in Noah’s day, an extended family from Abraham to Jacob and Joseph, a few years of spiritual prosperity in the early years of Solomon’s reign, a few who returned to Jerusalem after being taken captive to Babylon because of transgression, a few in the time of Christ, a few scattered around the world before the Protestant Reformation, a few Adventists after 1844, a few Reformers after World Wars I and II, and just a few today. True, they were always under pressure of some kind, because the evil one is unrelenting; but take time to look closely at those who put God’s interests first! Leaders of all kinds are especially vulnerable to adopting the world’s group think; and if religious leaders who do so are put in the position of the three Hebrews in Babylon, it is only natural for them to find an excuse to give in to the pressure. Take a look at evidence from just the last hundred years among Adventism. In the early 20th century, a day came when the government’s demand for soldiers brought the Adventists face to face with the sum total of the compromises they had made over the previous decades by centering in self and power and bowing to the government whenever it seemed expeditious. It was really a group mindset that had been acquired and was now plain for all to see. The problem was that 98 percent of the leaders and members had acquired it, and there were only 2% who thought differently. Their adherence to Heaven’s principles was considered as rebellion against the leadership, and they were cast out. And worse, their former pastors reported them to the government to be imprisoned, persecuted, tortured, and in some cases killed. And not just once. The whole scenario was repeated 20 years later. Adventist leaders continued to operate on the mistaken idea that church leaders had the authority and duty to give a member license to submit his conscience to the control of another, in this case the government. This was urged even though individual conscience, enlightened by God's law, was brought into perplexity and conflict with the government's military requirements and agenda. Some leaders even asserted that the individual bears no responsibility for his own actions when the government issues a command. Self-centeredness–but now it was more like organization-centeredness–had assumed the ascendancy again for all but a very few. Another 8 decades have passed, and a whole new generation is onstage in a world that can receive the news of important and not-so-important events in just seconds. 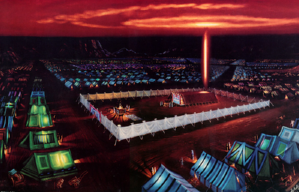 Prophecy–especially Revelation 13–implies that previous events were just so many quizzes in comparison to the final test that’s coming. And what is the church doing now? If it is calling and inspiring Abrahams, Jacobs, Josephs, and Daniels to glorify God and God alone, it is fulfilling its purpose. If it is organization-centered, if its people are self-centered, it is not. But think. Do we consider ourselves somehow safe from the natural tendencies of our fallen human natures toward self-centeredness and love of power and control? The world around us–financial, political, entertainment, even environmental–is imploding because of self-centeredness. Rare indeed is the individual who dedicates himself, as did Jesus, wholly to the good of others, trusting that God absolutely takes care of those who obey Him–love Him, glorify Him. 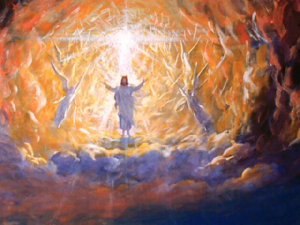 But there are some who choose the divine perspective; they are thrilled that Jesus’ coming will soon be a reality. And the world will soon witness the enormous difference between those who love God and are filled with His Spirit and those who do not. Meanwhile, the principles of the heavenly kingdom are unchanged and eternal. Cherish Jesus’ words: “…Whosoever heareth these sayings of Mine, and doeth them, I will liken him unto a wise man, which built his house upon a rock.” Matthew 7:24. Note: Documentation of events and facts alluded to in this summary are available elsewhere on this website.